… and that’s a great user experience. It’s our users that we should be trying to understand and we should be letting them guide us towards the most meaningful performance metrics! After all what ever product or service we’re building it’s our users that choose to make it a success or not. Too often they are having an awful slow experience. Not everyone is on the latest and greatest device. And many of the next billion or so people who connect to the web for the first time will be doing so on slow devices over slow infrastructure across the developing world. And all they want is our awesome content. So when we talk about “meaningful” metrics. I believe we should focus our attention on the metrics that best represents the users experience and what they are actually seeing and experiencing. Not all pixels on screen are equal. As you can see these are simple questions, and ideally there should be simple answers. Unfortunately users really don’t care about any of that. They just don’t care what your stack is! Now I’ve seen many wonderful talks on the intricacies of how various performance metrics work. The complex algorithms behind them and how they are the next best thing! Paul Irish and Addy Osmani in particular have done great talks on the nuts and bolts of performance metrics and I’d really recommend watching their talks to get the details on how each metric works. Lets use our eyes! Lets pick metrics that reflects what our users are actually seeing and doing. … and that’s good old WebPageTest. We owe everything to this tool! It’s the giant whose shoulders we stand upon. On a day to day basis I often feel like this. It really is at the core of many of tools and techniques we rely on in the performance community. So thanks again to Pat Mennan for the tireless work you do on WebPageTest. And why is that we spend so much time in this tool? I thinks it’s because of one simple thing. The filmstrip! It doesn’t matter what happens in the browser, WebPageTest is sitting there like a neutral observer just recording whatever happens on screen. It gives us the perspective of the user and allows us to keep that top of mind while we then dive into and interrogate all the other available data. It allows us to relate all the performance data and metrics we have back to what we see in the filmstrip. The content on screen that actually matter to users. Be it various metrics, what the browser main thread is doing. What’s happening with our requests over the network. How does that all correlate back to what the user actually sees in their browser? What if we could pick a moment on screen that we care about, and let it tell us what metrics fired as close as possible to that moment in time. Was it last painted hero, was it first meaningful paint or start render? Maybe it was all three that match the moment when the main headline on this page was visible to a user. Now I’m lucky enough to work everyday with this clever fish. Steve Souders, the godfather of the perf community. One of things I enjoy the most about working with Steve is that he expresses his thought process and ideas through code. Much to my ongoing frustration, you can’t slip anything past him without the data to back it up. So when we talked about the idea of using the filmstrip as a way of evaluating metrics. He whipped up an experiment in no time and called it the Rendering Metrics Picker. Is the very first pixels of content you see? Is it when the hero content like the main heading or image is visible? Or is it when all the content in the viewport is finished. It's up to you. So let’s try a few of these together. So together the top 3 metrics captured 72% of the moments that correlated the strongest with what the users actually saw. Lets take look at the top three metrics in a bit more detail, and find out what they actually represent. Last Painted Hero is the point in time that all the hero elements on the page have finished rendering. Paul Irish came up with the name "Last Painted Hero" and he's keen to see the metric added to Chrome. Very happy to announce today that we’ll be contributing the code for hero rendering times back to WebPageTest. We’re just working through a final review of the pull request and soon anyone using WebPageTest will be able to get Hero Rendering Times and Last Painted Hero. Good old speed index. It has been around for a number of years now and still holds it’s own. Webpagetest records video as a page loads and from this calculates a percentage of how visually complete a page is at any given point. You can then plot the visual completeness over time. In this example we see how the third party ads are causing JS long tasks over 50ms and that's pushing the First Interactive right out to 10s. You need to audit your third parties and look at their impact on your user experience. Now for a talk about meaningful metrics it would be odd to not mention some of the recent metrics from the Chrome team like First Meaningful Paint. They sound so promising and yet they didn’t feature highly when we picked metrics based on what we can see in the filmstrip. Why is that? I think of this as the inside out problem. Chrome only knows about what’s happening inside Chrome. It doesn’t actually know when a pixel was displayed on screen, it only knows when it sent it to the OS. When we matched up the video frames with these events they were often too early and just showed a white screen. When we dug into this issue we saw a delay of around 100-200ms between the metric and the next paint event in WebPageTest. This is why I love WebPageTest and the video it captures so much. It’s a neutral observer. Now these new metrics from Chrome are interesting and it’s worth keeping an eye on the paint timing spec to see how they evolve and how they are implemented by the browser vendors. I was really disappointed to see that First Meaningful Paint is not in the spec. These metrics could be really useful in RUM, where we are not capturing a filmstrip for every user. This is why we saw last painted hero perform the best when comparing the metrics to user experience. As it focused on the hero elements just like our users do! As articulated by Steve this is a way of filtering out the metrics that don’t prioritise the content we care about. We also want to know how hard it is to get up and running. People are lazy, if we can get a metric out of the box without any work then those are the metrics we lean towards. Do I get it automatically or do I have to do a whole lot of work to implement it. Does this metric represent real life, what my users actually experience or is it a metric that just comes out of the synthetic lab. And do I have a way to relate the metrics I see in the wild with what I see in the lab. "Time to first tweet" is a great example of a User Timing metric that gives meaning to the metric that the whole organisation can recognise and work together to improve. An important concept to get our head around before we start looking at specific optimisations. We want to think of our pages as a time based experience rather than a static page. Keep those filmstrips in mind. How do we flow the content of the page in and out of the browser over time? I think we still have some deep challenges between the design and development teams in most organisations. To often the design and marketing teams run away and cook up some really rich designs and then chuck them over the fence to development who do their best to make them fast. The mental model here is that they are just trying to create the final static design as fast as possible and not think out how we flow the content into the browser. It's a time based medium and if you force people to wait then you've lost them! Ilya Grigorik did a great presentation on what it takes to render a webpage in under one second. You really only have one request and it should be under 14k. 14k doesn't sound like much, but that's more than enough to tell a user they are in the right place. Give them the brand colour, a logo and the skeleton of the page. Reassure them they are in the right place. There's no reason while all our sites should be rendering some content for users in under half a second. Just unblock your JS & CSS and then inline the critical CSS. Boom! And most importantly, never forget that we’re all working in service of our users. We want to use these metrics to get as close as possible to the experience people are having. It it fast or slow? Lets hope that while we are adding more content and functionality to our website we’re also making them faster and more joyous to use. 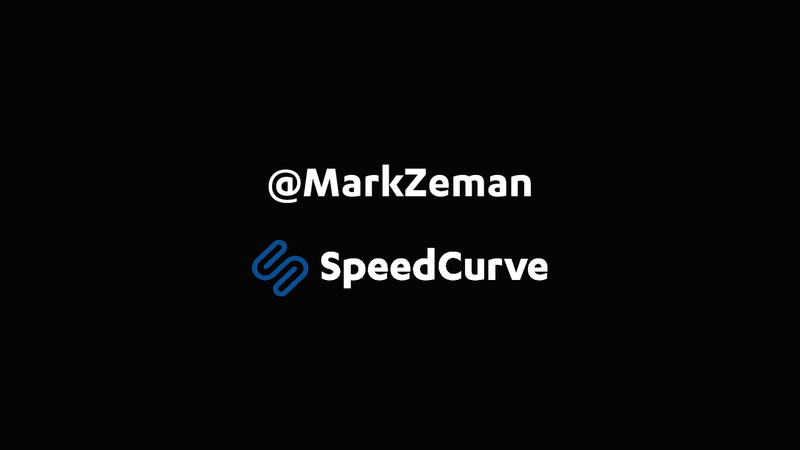 And you can also find all the content I've been talking today and much more on the SpeedCurve blog. View Meaningful UX performance metrics and how to improve them on Notist. Performance metrics are critical for understanding the impact of our work as web developers on improving our user experience and making it a joy to use. But not all performance metrics do a great job of representing what our users actual see and experience. Network metrics have been around for decades, but rendering metrics are newer, and they’re doing a better job of capturing the moment critical content is visible. Mark offers an overview of available rendering metrics, including newcomers like Time to Interactive and Time to First Meaningful Paint, and helps you pick the right metrics to focus on for your website and your users. Along the way, Mark outlines several techniques for improving the rendering experience of your websites, including delivering your brand in the first request, building a skeleton screen of elements, image SVG placeholders, and progressing rendering. You’ll leave armed with performance metrics and rendering techniques that will help you best improve your user experience. ❤️ everything SpeedCurve have been doing lately: First Input Delay support, Long Tasks, CPU Scripting time, Perf Budget support, Last Painted Hero. Y'all are rocking the performance monitoring space big time.